* Combined total record count of Members and Contacts Payment is secure over SSL via paypal - if you don't have a paypal account you can still use buy now, when the screen opens select this option.. Don't have a PayPal account? Use your credit card or bank account (where available). Continue Continue <- click the continue link... Neighbourhood Watch Software Street & Member Register, Group Email, Crime Register, Crime Graphs, Organisation/Contacts Register, Notes Database, Standard Letters & Basic Finance Module + inbuilt Zip Backup..... Sales so far cover the USA and UK, other countries using NWWorks range from Canada to Kenya, and includes Police Departments, City Councils, Neighbourhood Watch Schemes & Clubs. NWWorks Main Features • Organise your members and send emails • Membership - Any number of members past/present may be logged including full contact information. 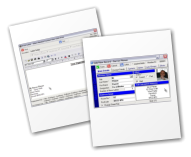 If a modem is attached all numbers may be dialled direct including opening of web sites and e-mails • Group EMail - Enables any number of email groups to be set-up and any number of Members and Organisation/Contacts to be added to each group. An e-mail may be typed and if required a file attached. E-Mail is automatically generated using Bcc (blind carbon copy) • Crime Database Any number of records may be added and analysed. Each record is automatically logged as a crime or non-crime report. • Organisation/Contacts Register - Any number of Organisations/associated contacts may be logged and any number of contacts/phone details added against each Organisation. • Super Notes - Any number and type of note may be added including follow-up notes, Notes marked to-do may be displayed on a single list. • Traders - A basic facility has been provided to log vetted/bona-fide traders. This list can also be group emailed to any group email list at the press of a button.